Exploring all that the islands of Hawaii have to offer could take years. We've got the inside scoop on some activities that you shouldn't miss. Plus some lodging reviews. Read on. Destination: Big Island... Activities, lodging & more. 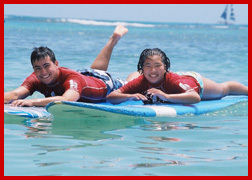 Surfing Waikiki... A family adventure. Snuba... An intro to Scuba on the Big Island. Hawaii Forest & Trails... Mule adventure. Waipio Wayside... Family B&B on the Big Island. KidzGear: Beach Toys... Stock up! KidzGear: Sandals... Fashion & function in footwear. KidzGear: Crocs... The MUST HAVE beach clog for Hawaii.